As she was planning her study to look into the role physical activity and sport play in the development of substance addiction, Laurie de Grace was forewarned that she may have trouble finding any recovering addicts with a sporting background to speak with. After all, sport and physical activity go hand in hand with good mental health–or so conventional wisdom would suggest. Rather than looking at individuals in sport and trying to identify the pathway to addiction, de Grace flipped the model and interviewed people in recovery from addiction, virtually all of whom had a sporting background. She categorized the participants based on their level of sport engagement, from recreational athletes to those who played sports as youngsters but dropped out in high school–often because of drugs and alcohol–to the largest group, elite athletes. 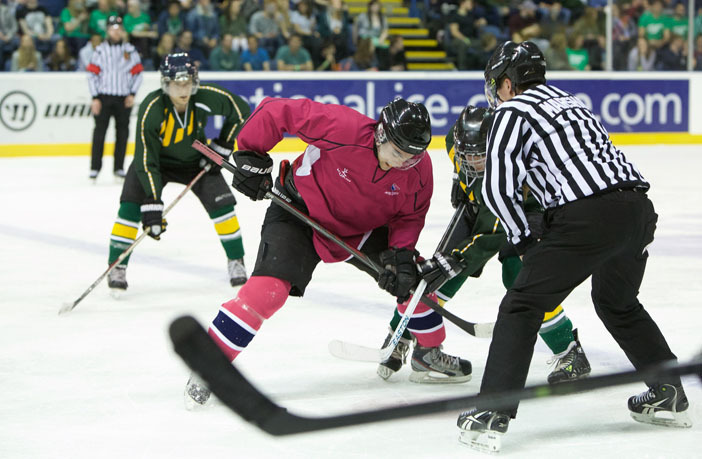 Though a full spectrum of sports was represented in the study–including gymnastics, martial arts, rowing and dance–most participants competed in team sports, hockey in particular. Patterns regarding the culture of sport began to emerge, the most prominent being social acceptance and normalization of drugs and alcohol, and how role models–if not implicit in the culture of substance use–did little in the way of curbing it. One study participant who had played junior A hockey recalled how the team owner would load flats of beer onto the team bus. Now in his 30s, he said it was his participation on the team that started his addiction. Another common trait among the study group was hyper-competitiveness, which de Grace said manifested itself in heavy substance use and abuse. Some elite athletes cited losing their ability to participate in sport through injury or being cut from a team as a factor that contributed to their addiction. One of the recovering addicts who lost his sport to injury was a hockey enforcer–players who find a role on the team standing up physically for teammates. Although the majority of athletes who are exposed to this nuance of sporting culture come out the other side none the worse for wear, there is a segment that needs protection. Wendy Rodgers, a professor in the Faculty of Physical Education and Recreation and project supervisor, said it is well documented that if people don’t start on the path to using substances before they are 21 years old, they are less likely to develop substance dependence. “There is a vulnerable period of life that seems to correspond with an elite performance level in high school when there are a bunch of things going on that can contribute to problems later in life,” she said, adding she was surprised about the extent to which drugs and alcohol were available to underage kids playing sports. “That is definitely a context where we can take more control of what is happening with teams and how they are behaving and engaging with the rest of the community,” she said. Rodgers cautions that this is just one study and it is from the perspective of a particular group of people, but adds that while the results are not unexpected, the extent was surprising. She said substance use has become entrenched in the culture of sport, pointing to filling up the Stanley Cup with champagne, beer-filled locker rooms of every stripe and even the lore surrounding the championship Oilers and their hard partying. And though sport participation in itself is a healthy activity, de Grace noted it is the culture that puts some people at an additional risk of substance addiction. She said some individuals interviewed even expressed concern about engaging in their sport at a recreational level in the future. The study was published in Psychology of Sport and Exercise.